Crocheting skill was of great help to our grandmothers and mothers when there were no other options of getting children dressed in something nice and expensive. Old clothes were crocheted out and they were crocheted back into something new – special sweaters, dresses, hats. Nowadays shops have an abundance of all sorts of threads that is produced in the countries of the whole worlds. 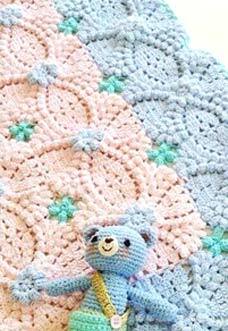 It differs in quality yet there is a special thread for crocheting of child-related products. There are child-related items for sale, yet they are made by machines or cut out of jersey and then the cuts are overlockered. Such items are bright and beautiful but they lack warmth of mother hands. They are produced in great quantities and batches, filling the markets of the city. When we are crocheting for children we show a child the idea of a good taste and teach it to be dressed well from the very early age. Ask five year olds to choose the thread – this way a child will know how to combine and chose hues. Synthetic thread is often brighter yet they are not recommended for small children. The use of synthetic thread can be harmful in winter when a child will catch cold wearing that item – or in summer, when the child will be sweating. For children we should solely choose natural fibers: linen, cotton, hypo allergic wool. Usually bundles of thread are labeled and thus give information on the contents. Crocheted clothes for boys are stricter and more practical as boy are known for preferring loud games. Thus their clothes should not be fragile and easy to tear. So it is better to crochet trousers or sweater in a simpler yet more reliable technique, without Pointelle elements or complications. The elements that are used the most often are all types of elastic bands and simple type of thread. This is an especially interesting crocheting technique as when crocheting for girls you can use your imagination and embellish clothes with bows and braids, lurex, beads and lace. Usually the models for dresses and hats for girls are represented in warm color palette and are the pleasure for the eye. Girls are future ladies and they need to have a good taste and appreciation of apparels, ability to combine clothes items in an ensemble, ability to bear personality yet stay away from being vulgar, know the limits and choose high-quality items. It is in the early age that the background for good taste is set and crocheted clothes elements allow to teach a girl the idea of style in clothing. In winter she will prefer sports style, represented by sweater, jumper or thick warm sweatshirt. In summer – apparel in Bach or Shabby-chic style – flounce, decorated with roses and lace.